Could DC Add Bike Lanes to Its Traffic Circles? Roundabouts can have big safety and environmental benefits, but can they be adapted to be great places for bicycling as well? 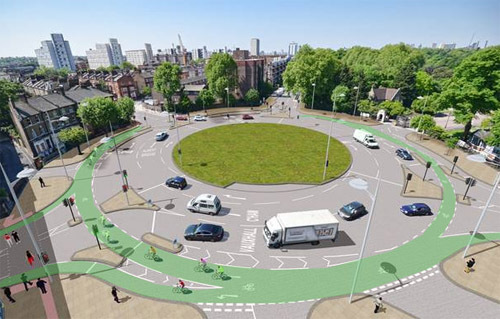 Malouff says a city of London plan to add bike lanes to the busy Queens’ Circus traffic circle, pictured above, is interesting but has some drawbacks. This is sort of a good design. It’s better than nothing. But with so many crossings, it’s still pretty confusing what’s the bike lane and what’s for cars. It seems likely there will still be a lot of intimidating cross traffic. In fact, the actual design doesn’t even have the green paint; I added that to make the rendering clearer. The other big problem with the London example is that pedestrians are mostly absent. Unlike DC’s circles that typically have popular parks in the middle, this London circle is just a road. The central grassy section isn’t a useful park, and there are no pedestrian crossings into it. That obviously changes how the entire thing functions. Malouff says an older example from the Netherlands might actually provide more protection, by placing the bike lane on a wide sidewalk. But the London example might be a more politically realistic goal for DC, he says. Elsewhere on the Network today: The Architect’s Newspaper reports that Detroit has broken ground on its long-awaited 3.3-mile M1 light rail system. Price of Sprawl attempts to calculate the public cost of a newly approved sprawling development in Palm Beach County, Florida. And Human Transit explains how to develop a liberating transit system in a smaller city. A traffic circle free-for-all that's been a constant source of danger for bike riders and pedestrians in Washington, DC, is about to get a one-week makeover. The experiment shows that if you build it, they will come -- even in smaller cities without a strong culture around active transportation.